When it comes to building for a phone specifically for a carrier, HTC is no stranger to a custom job. Over the last year it's built the HTC One X and HTC One X+ for AT&T and the Droid DNA for Verizon. Both phones are quality quad-core devices with gorgeous screens, and the premium price tags that such hardware entails. For AT&T customers not ready to spend big for a flagship device, there's the HTC One VX. With a dual-core processor and lower resolution screen, it's decidedly mid-range but essentially free with a two-year contract. Currently, Amazon is selling the white and silver model for a penny, and there's a handsome red and gray model priced just as cheaply, and sold through AT&T's website. Off contract you'll pay $400. The One VX offers some of the best of HTC design, like Beats Audio and a bright, clear display, plus a few things HTC doesn't usually offer, like a removable back with expandable microSD storage and an all day battery. 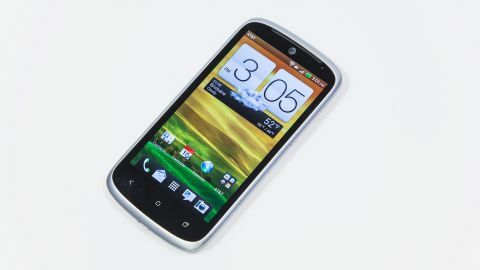 Consider this: If you're signing up for two years with AT&T, the far zippier HTC One X is just $100 away, the One X+ just $200. Of course, the mediocre battery life of those devices mean that it's a judgement call as to which phone is better for you. As far as free phones go, the One VX is among the best being given away on AT&T. It's capable despite its aging internals and software. What's more, the big screen, removable storage, and Beats Audio make it surprisingly media savvy for a mid-range device. Just be prepared to deal with a few performance quirks, and don't expect an upgrade to Android 4.1: Jelly Bean anytime soon. At 5.26 x 2.66 x 0.36-inches, the HTC One VX is tall for a mid-range device, at least when compared with something like the Droid Razr M. It's close in size to its more expensive siblings, the HTC One X and One X+. It's not an objectionable size though, since it makes room for a 4.5-inch display Super LCD display, bordered by silver (or grey) trim. At 4.4 ounces it's a nice balanced weight that you can forget about in your pocket. Hold the One VX in your hand and it's unmistakably plastic. Smooth, pleasant and somewhat grippy plastic, but plastic nonetheless. There's also the fact that most of the phone's weight comes from its screen, giving the body a somewhat hollow and cheap feeling. It's very much a "get what you pay for" situation. The build feels somewhere between premium and budget, which is exactly what the One VX is, a mid-range phone. At the top of the phone you'll find some branding: a globe logo to remind you that the One VX is an AT&T exclusive. To the right of the logo you'll find a front-facing camera with a very basic 640×480 VGA resolution. The VX's headphone jack is located on the top left, with a power/lock button to its right. A volume rocker is found on the right side. This brings us to one of our issues with the VX's design: the buttons are too flat. They are almost completely flush with the body of the phone, and can be hard to find when you're reaching into your pocket to adjust the phone's volume. They also require an awfully firm press and don't provide much give. The back of the phone is an elegant white (or burnt orange), and it's actually removable, unlike most HTC devices. On the rear there's a lense for the VX's camera, which has a rather fair 5-megapixel count. There's also an LED flash. As we mentioned, the phone's back comes off. It's the sort of bendy and surprisingly durable plastic backing that you'll find on the Samsung Galaxy S3 and Galaxy Note 2. Rather nice in white, isn't it? The removable backing gives you access to a micro-SIM slot and microSD port. The 1800 mAh battery, however, is not removable, but we never had trouble getting through the day on a single charge - more on that in the Battery section of this review.